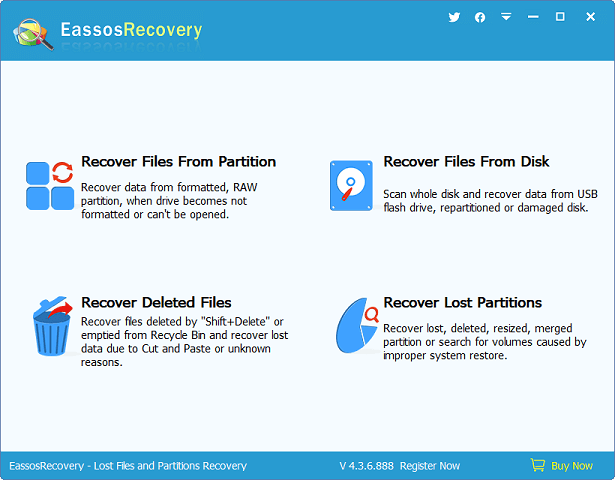 How to use Eassos Recovery? 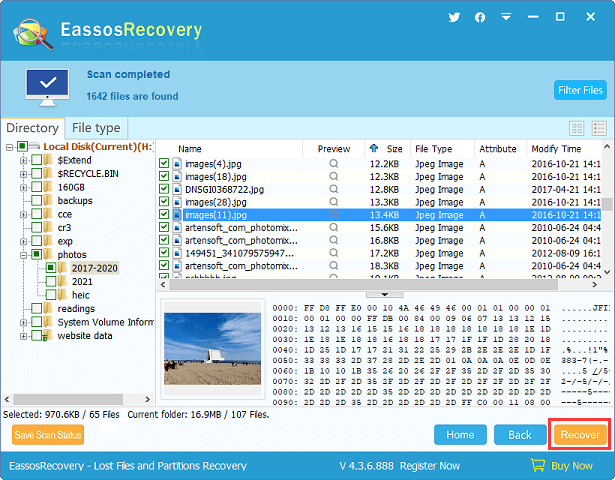 Eassos Recovery is efficient and easy-to-use data recovery software that helps users to recover lost photos, videos, audios, documents and other data from all kinds of storage devices. 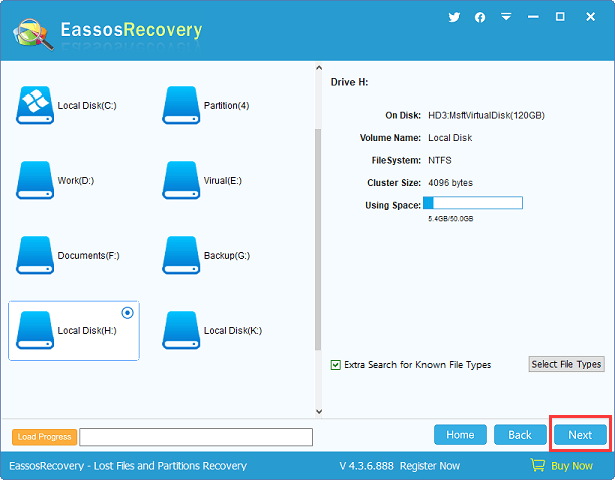 Here is the step-by-step tutorial about how to recover lost data with Eassos Recovery. 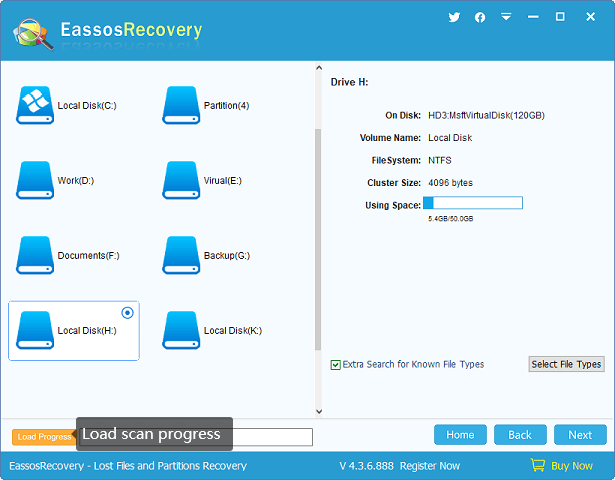 Download Eassos Recovery and install it on Windows computer, and then double click the icon to start it. Please note that the software can't be installed to the partition where lost files were located. If you want to recover lost data from USB drive, please connect it to computer so that it can be recognized by computer. When you start Eassos Recovery on your computer, you will see 4 recovery modules on the main interface. You need to choose one module according to data loss causes; it's easy to find out the most appropriate one, as there is concise introduction to each function. Please select a location and click "Next" button to scan lost files. 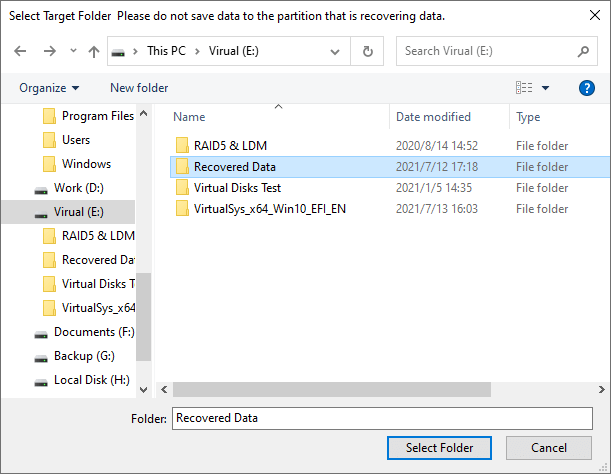 The location should be the partition or disk that needs recovering data. By default the option "Extra Search for Known File Types" is selected, which is deep scan function. If it is selected, Eassos Recovery will perform a sector by sector scan for selected area and scan process will take longer time. Please be patient and do not interrupt it in the middle of the process. 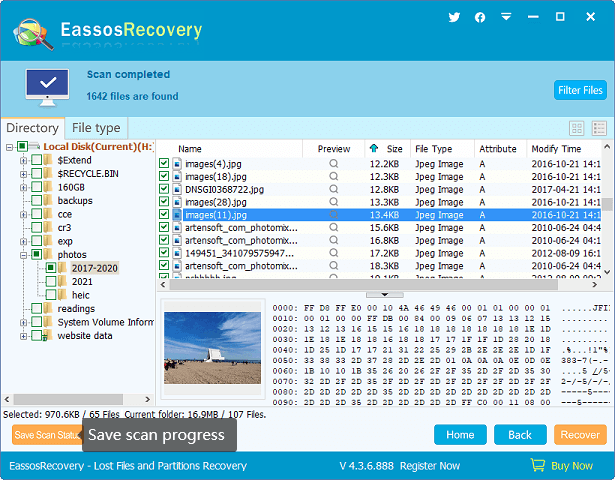 Eassos Recovery is scanning selected storage device as following picture. In the upper part of the interface is the process bar showing the scanning progress. Next to the bar there are two buttons: Pause and Stop. You can use Pause button to temporarily pause the scan and resume recovery later. During the recovery process, you can preview files at the same time. If files you need have been found out, you can click "Pause" to recover them first. Then click "Continue" or "Stop" for rest operations. The interface displaying scanning result is divided into 2 parts. The left is the file directory tree list which further displays files by directory and types. The right part shows files and folders under the selected directory of left window. When you click a file, you'll see a thumbnail preview in the lower part. You can view file in original size by clicking "Preview". 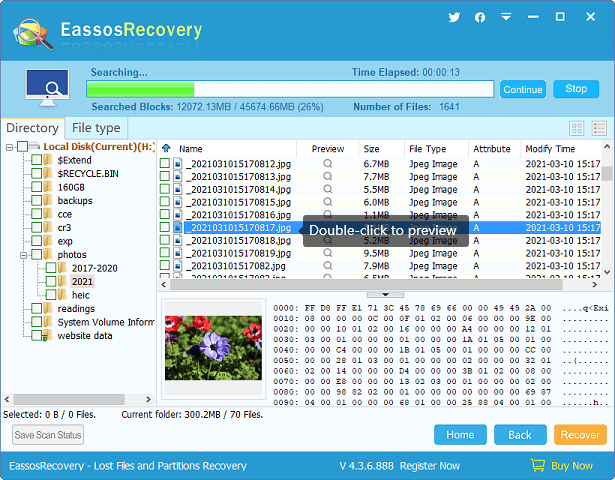 Eassos Recovery is able to preview photos, documents, photos and audio files. Besides, you can filter lost files in the scanning result by file extensions, name, size, etc. When you find out files you want to recover, please check files and click "Recover" button. Then choose a location to save recovered files. DO NOT save data to the place where lost files were located in case that recovered files get overwritten. Moreover, when you stop the scan process, you can save current scanning result, so that you can resume recovery without scanning from start once again next time. Scan status can be saved in a file with extension .dgrp. Just click the button "Save Scan Status" at the bottom-left of the interface to save the scanning result. If you want to perform another recovery, click "Load Progress" to import scanning result before clicking "Next" button. Then previous scanning status will be loaded and displayed without scanning again. "Thank you! I did that with great results. I made the purchase and your product did what three others can't! All files were recovered." "Great data recovery! The 4.0.1 worked great to recover 200GB data with affordable price! " "I bought 30-day license and recovered all files from formatted drive F, which might be 150GB. That's really worth the money. THX." "Just want to thank you for this great program. I used it to get back all files from a RAW partition on my laptop. This tool is really something!" "It recovered all data from external hard drive which couldn't be opened and reported errors. Well done, Eassos software."